Consumer prices in South Korea rose 2.0 percent from the same month of last year in November, keeping the same pace with the previous month boosted by a jump in fresh food and oil prices. 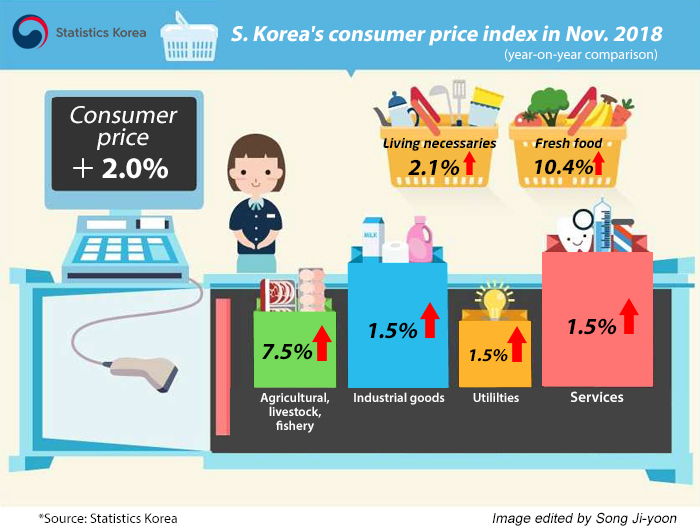 According to Statistics Korea on Tuesday, the country’s consumer price index (CPI) gained 2.0 percent against a year-ago period, maintaining the country`s inflation target of “around 2 percent” for the second straight month. It was for the first time in 14 months that the nation’s consumer price index rose by 2 percent for two months in a row. The gain in CPI was mainly led by a surge in prices of agricultural products and energy costs, according to data. In November, prices of agricultural, livestock and fishery products surged 7.5 percent on year, bumping up the headline index by 0.6 percentage point. Prices of agricultural produce jumped 14.4 percent and fishery products gained 3.0 percent, while livestock prices dropped 1.5 percent. Petroleum prices also went up sharply in November. It soared 6.5 percent on year and pushed up the headline index by 0.3 percentage point, with diesel prices up 9.1 percent and gasoline 5.1 percent. The rapid price gains in fuel boosted prices of industrial goods by 1.5 percent, driving up the headline index by 0.47 percentage point. Service prices, which account for the largest share in CPI, gained 1.5 percent, lifting the CPI by 0.82 percentage point. Individual service fees rose 2.5 percent, boosted by cost increases in dining out by 2.5 percent, apartment complex management 4.0 percent and housekeeping 11.4 percent. The index for everyday expenses reflecting spending for staple food and utility fees rose 2.1 percent on year, with the fresh food index surging 10.4 percent. Core inflation, which excludes volatile oil and agricultural product costs, rose 1.3 percent in November from the same period last year. The CPI without food and energy, the standard by the Organization for Economic Cooperation and Development (OECD), grew 1.1 percent on year but slipped 0.1 percent on month. With the consumer price inflation remaining near the target level, the nation’s central bank raised the benchmark interest rate to 1.75 percent from 1.50 percent last week, its first rate action in a year. But the Bank of Korea claimed it will maintain its “accommodative” monetary policy as other data indicate a slowdown in the country’s overall economic activity. In particular, consumer and business sentiment shows no sign of immediate recovery with the country’s job market remaining lethargic and corporate investment stalling. On Tuesday, the benchmark three-year government bond yield rose 0.1 basis point from the previous session to 1.925 percent while the five-year yield fell 1.5 basis point to 1.983 percent during the morning session.